Life aboard when cruising is generally all about new - new places, new friends, new adventures and new experiences. We spend a lot of time researching our next destinations, what to do when we get there as well as ensuring we have all the formalities taken care of, on top of making sure that Askari is ship shape. So the last couple of months have been like a holiday and coming back to Antigua with it's protected anchorages, friendly people, great bus service and old friends made us feel pretty relaxed. On top of that my Mum and Dad came to visit. After Anguilla we heading to St Barth's for a couple of days to eat great french food in Gustavia and enjoy a couple of our favourite anchorages at Ile Fourchue and Colombier. 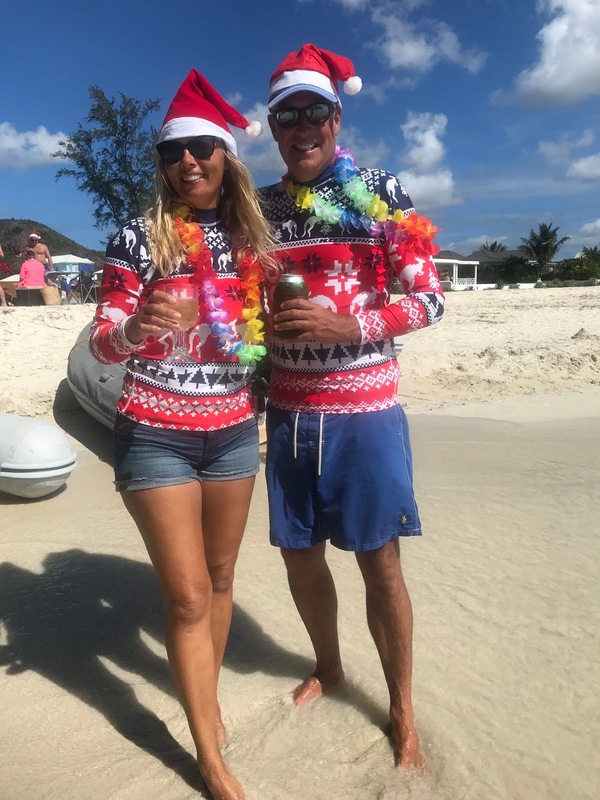 Then we decided to skip St Marteen/St Martin and take a weather window to head east to Antigua where we had decided we wanted to spend Christmas. Having all that 'Easting' behind us made us pretty happy as it should all be off the wind sailing for the rest of the season plus pulling into Jolly Harbour just felt like coming home. Knowing the Antiguan clearance system, we had it all done online before we arrived at the customs dock which made that super speedy and before we knew it we were legal, had filled up with fuel and were anchored in the bay that really is so beautiful. Now to get ready for Christmas. Our friends Paul and Bab's on Lyra Magna had already been in Antigua for a few weeks and had entrenched themselves with the Jolly Harbour Yacht Club, so we all got invited to a fabulous beach BBQ which of course involved a few drinkies and a lot of fun, Lionel and Elsie on Ruby Tuesday sailed in from Bermuda just in time to join us too. 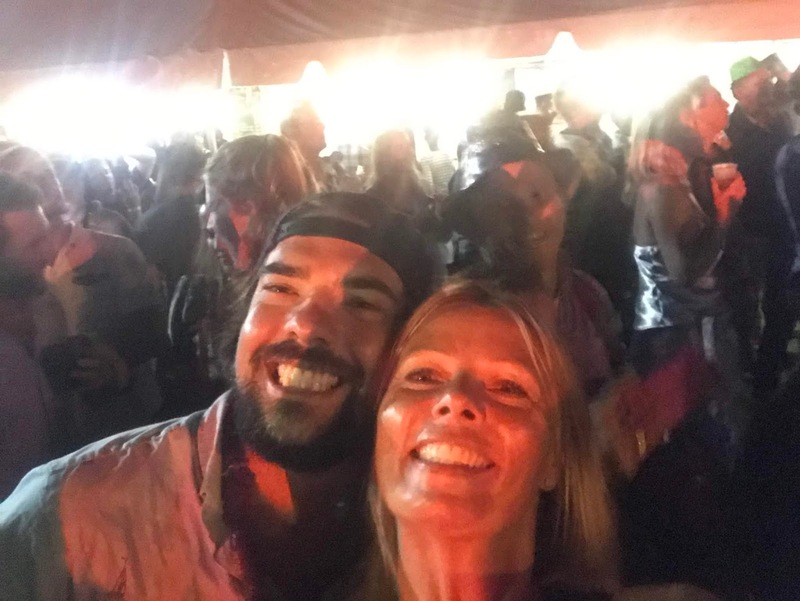 Jolly Harbour has a real community feel and we shared lots of drinks and great nights watching music and socialising. When it all got a bit 'peoplie' we snuck off to some of the quite anchorages at North Sound. 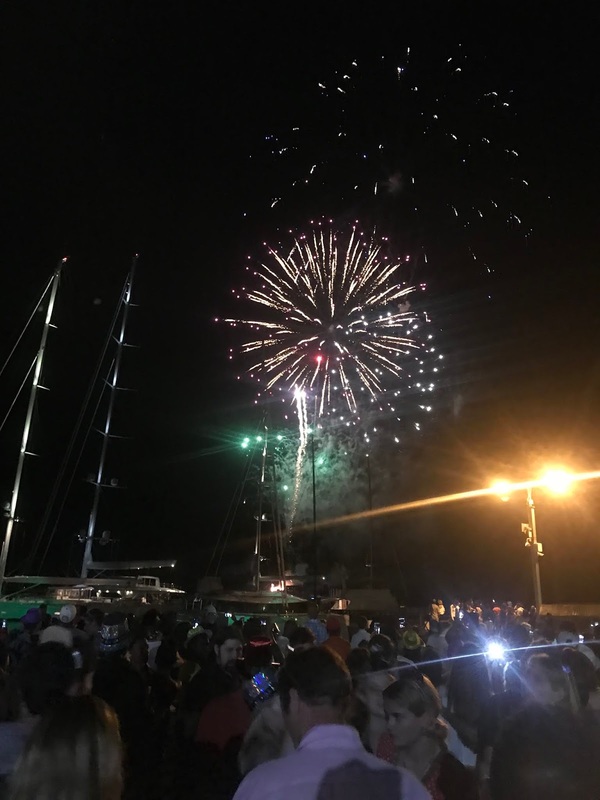 New Year however we decided that we would join the massive party at Nelsons Dockyard for fireworks and music. We had a fun night with the crews of Vela, Delos and Endless Playtime - all of which have You Tube channels - luckily the cameras were mostly away but the rum definitely flowed. I think we got back to Askari in Falmouth Harbour about 3am and the Antiguan's were still partying. 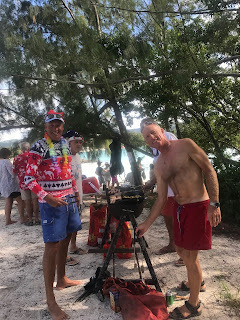 One of the things that has certainly changed since our first sailing trip 15 years ago is younger sailers making money as they travel the world making interesting videos posted distributed through social media - good on them I say. After New Year we definitely needed to dry out so we headed around to Non-Such Bay with Vela and had a few lovely days snorkelling and watching kite boarding; however it gets a bit much when they get too close to the boat so we decided to go and explore Emerald Cove. This is a cute little mangrove anchorage we took Revision II into on our first time in Antigua and I saw fireflies for the first time. We cautiously squeezed Askari into this small spot and it was heavenly to be all on our own. Then Devon arrived and offered us Lobster - yay this really was perfect. We took the chance to explore this side of the island with a hike to Devils Bridge and Long Bay - Devils Bridge was named that as slaves from nearby plantations were known to use this spot to take their own lives; there definitely isn't any going back if you jumped in here with the swell rolling straight in from the Atlantic. Behind the Reef at Green Island - wow! The route between Falmouth Harbour and Jolly Harbour takes you inside two bands of reef, with a gap in the middle. We had dived this area a couple of years ago but hadn't taken Askari there. This season has so far provided many calm days; great for exploring. On the way back to Jolly it looked too good to be true, so we went into full 'bombie' spotting mode and ventured in between the reefs and found a great anchorage out of the ocean swell. There was a narrow gap in the reef so we gathered our dive gear and worked our way out onto the ocean side. We've been getting braver with our independent diving but never anchored in the open ocean outside of the reef before; the swell was manageable and we anchored our dinghy and then went for a fantastic dive where we spotted several sharks, lots of rays and heaps of fish even if the coral wasn't that great. Back in Jolly we met up with Lyra Magna again and plotted a trip together to North Sound, they nearly didn't make it when their engine broke down as they got into the reef zone. But ever the fix it man Paul replaced a hose and they made it in time for sundowners and dinner on Askari. 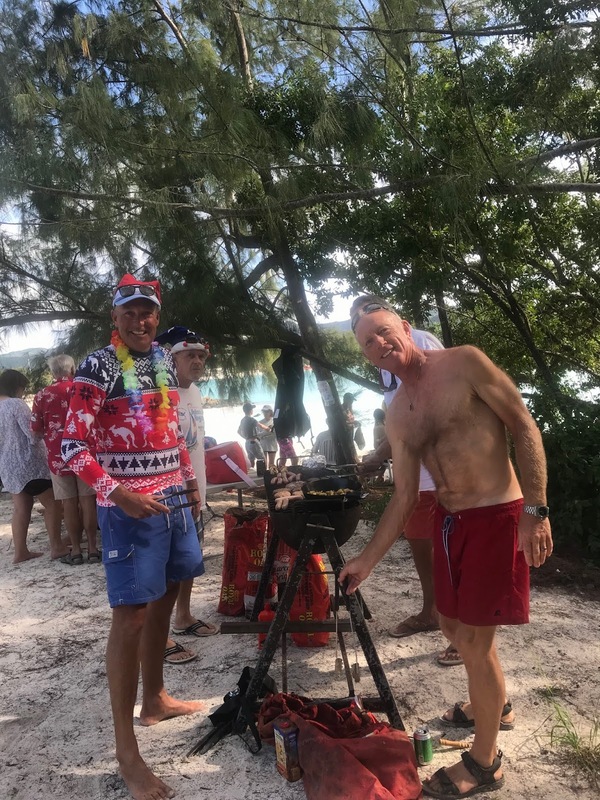 The next day we explored the reef and bird island together before being joined in the anchorage by Passport who scheduled an OCC rendezvous. Lyra Magna and Askari headed up to Barbuda the next day - perfect sailing conditions meant a bit of a race and we even got our spinnaker out until it didn't go so well and ended up in the water. Anchored in Low Bay we were able to see some of the devastation caused by Hurricane Maria, including washing away a whole section of the peninsular giving access to the lagoon and allowing us to dinghy to the town of Codrington. We had a great evening ashore, with our own beach and the Moana crew joined us too. Barbuda is still spectacular with the most amazing beaches - but get there quick as after the hurricane it is fast being sold off for development which was not possible before due to historic legislation which the locals have now changed to get funding to rebuild. 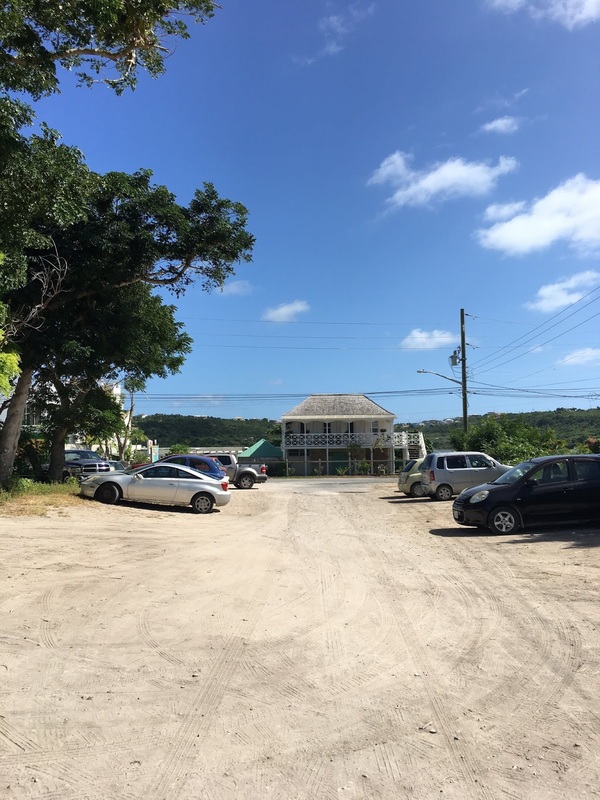 We had very mixed emotions exploring Codrington the next day - it was great to see some rebuilding, however there's still a lot of ruined properties and the development may now change this rare unspoilt island forever. After Barbuda we weren't done with North Sound so went back for a few more days of reef time and took another trip down memory lane with a visit to the very Antiguan village of Parham. A place that sees few tourists and mainly fishermen. We had a great time and a very cheap lunch - chicken and chips for EC$10. A last minute decision by my parents to fly out and join us kept us busy as tour guides for a week and we managed to get them to quite a few of our favourite Antiguan spots, including Nelsons Dockyard, Shirley Heights, North Sound and Deep bay to snorkel on a wreck, plus of course Jolly Harbour. Their last day was Australia Day so we treated them to a traditional aussie day treat of snags on the BBQ followed by a beer at the beach! After Mum and Dad left we quickly whizzed back around to Falmouth Harbour and watched the arrival of the Antiguan girls rowing team, with other cruisers and the thousands of other spectators. The team of four became the first black female team to row across the Atlantic Ocean which they did in about 40 days. It was just amazing, although the politicians speeches were a bit long! It was one thing after another as then the cricket started - we had tickets for the first day of the Test between West Indies and England. It was a great atmosphere but England were hopeless and the game very one sided so we decided not to go to the next day but went for a great hike to Rendezvous Bay where we had a whole beach to ourselves. We took the bus to Swetes and walked to Fig Tree Drive, the hike then takes you up to a dam, through the rain forest and down to the beach. At the beach we met a dog - apparently a famous dog known for walking with anyone. His name is Shadow - he walked all the way back to Falmouth Harbour with us. Jonathan and Gabbie on Aqualuna had finally returned to Antigua, so we had a couple of great evenings out including a visit to the Royal Navy Tot Club and a final farewell at Catherines Cafe. Sadly this year they are going to travel West as we go South - we hope to see them again next year. After 6 weeks in Antigua, we decided it was time for pastures new again. 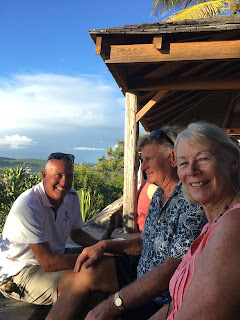 So we cleared out went for a lovely last drink at the beach with Steve and Nellie dawg from Alkemi and Robyn and Larry from Serafina and then set sail to Guadaloupe the next morning.